But the Michigan survey also found that, despite some ups and downs, use of marijuana (or its derivative, hashish) among 12th-graders is nearly as high as it was two decades ago. Last year, 22.2% reported using marijuana in the past 30 days, versus 22.8% in 1998. Past-month marijuana use among 10th-graders has declined a bit over that same period, from 18.7% to 16.7%, but is up from 14% in 2016. Marijuana was by far the most commonly used drug among teens last year, as it has been for decades. 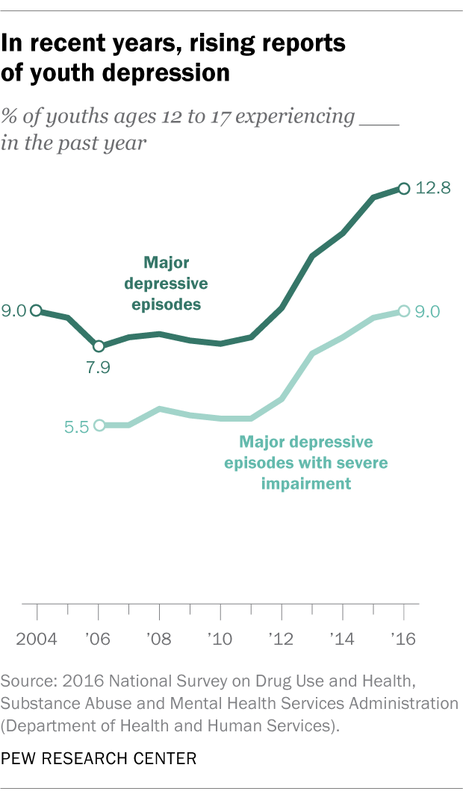 While more than 10% of 12th-graders reported using some illicit drug other than marijuana in the late 1990s and early 2000s, that figure had fallen to 6% by last year. The Michigan researchers noted that vaping, of both nicotine and marijuana, has jumped in popularity in the past few years. In 2018, 20.9% of 12th-graders and 16.1% of 10th-graders reported vaping nicotine in the past 30 days, about double the 2017 levels. By comparison, only 7.6% of 12th-graders and 4.2% of 10th-graders had smoked a cigarette in that time. And 7.5% of 12-graders and 7% of 10th-graders said they’d vaped marijuana within the past month, up from 4.9% and 4.3%, respectively, in 2017. Issues of personal safety also are on U.S. teens’ minds. The Center’s survey found that 55% of teens said bullying was a major problem among their peers, while a third called gangs a major problem. Bullying rates have held steady in recent years, according to a survey of youth risk behaviors by the Centers for Disease Control and Prevention. 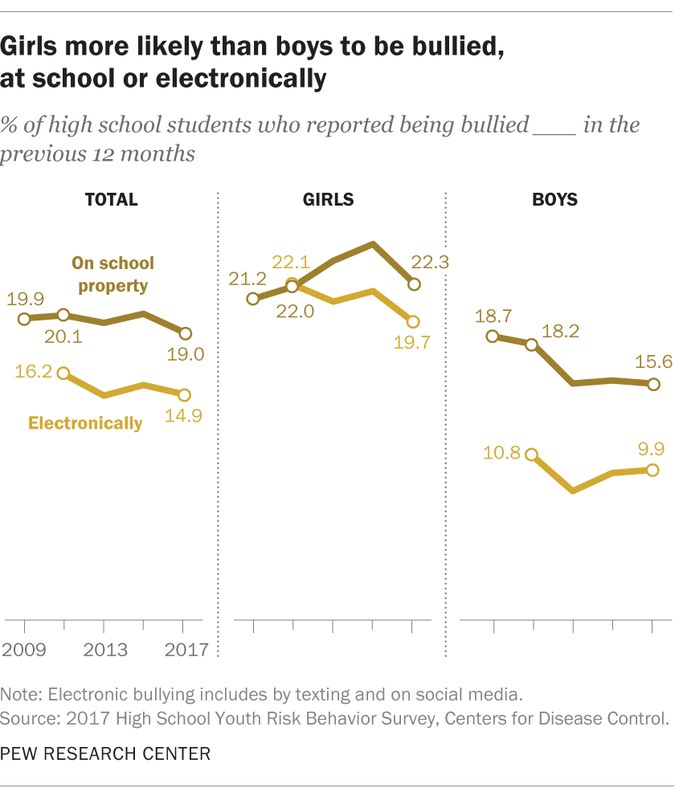 About a fifth of high school students (19% in 2017) reported being bullied on school property in the past 12 months, and 14.9% said they’d experienced cyberbullying (via texts, social media or other digital means) in the previous year. In both cases, girls, younger students, and students who identified as gay, lesbian or bisexual were more likely to say they’d been bullied. 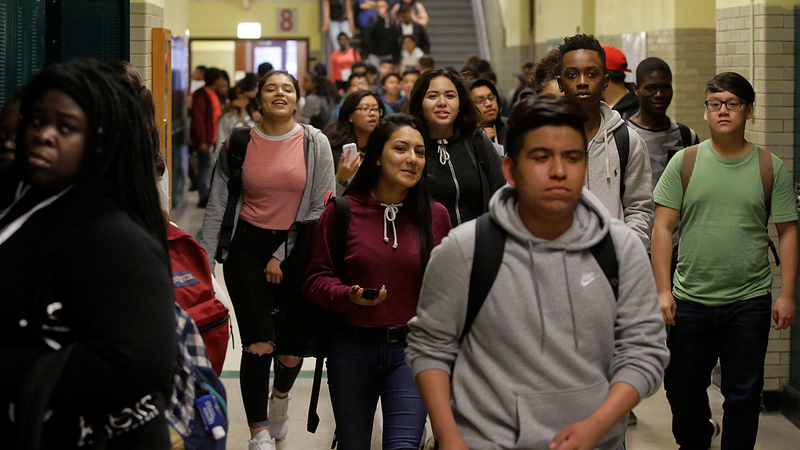 As for gangs, the share of students ages 12 to 18 who said gangs were present at their school fell from 20.1% in 2001 to 10.7% in 2015, according to a report on school safety from the federal departments of Education and Justice. Black and Hispanic students, as well as students in urban schools, were most likely to report the presence of gangs at school, but even for those groups the shares reporting this fell sharply between 2001 and 2015, the most recent year for which data are available. Four-in-ten teens say poverty is a major problem among their peers, according to the Center’s new report. In 2017, about 2.2 million 15- to 17-year-olds (17.6%) were living in households with incomes below the poverty level – up from 16.3% in 2009, but down from 18.9% in 2014, based on our analysis of Census data. Black teens were more than twice as likely as white teens to live in households below the poverty level (30.4% versus 14%); however, the share of white teens in below-poverty-level households had risen from 2009 (when it was 12.1%), while the share of black teens in below-poverty-level households was almost unchanged. Far fewer U.S. teens are having to juggle adolescence and parenthood, as teen births continue their long-term decline. Among 15- to 19-year-olds, the overall birthrate has fallen by two-thirds since 1991 – from 61.8 live births per 1,000 women to 20.3 in 2016, according to the CDC. All racial and ethnic groups have witnessed teen-birthrate declines of varying degrees: Among non-Hispanic blacks, for example, the rate fell from 118.2 live births per 1,000 in 1991 to 29.3 in 2016.